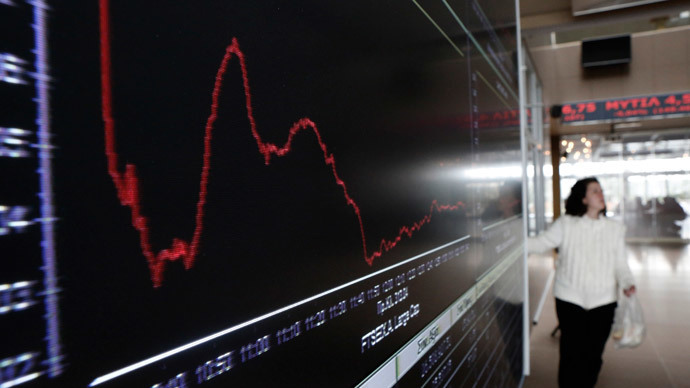 The Athens Stock Exchange index has fallen 11.2 percent - the biggest intraday plunge since December 1987. The government announced a snap presidential election, two months ahead of time, making investors nervous over the status of EU bailout money. When the credit crisis hit in 2012, Greek bonds wiped out nearly €130 billion from investors. On Tuesday, Greek Prime Minister Antonis Samaras said the election of a new president will be held next week instead of in two months time. Greeks will not go to the polls, but their elected members of parliament will vote for the president. The current ruling party, New Democracy, will need the candidate to win 200 votes in the first round on December 17, or the second round on December 23, or 180 votes in the final third round on December 29. If Samaras manages to rally the votes, Greek will “stay the course” and continue with EU reforms and austerity. There have been reports that former EU Commissioner Stavros Dimas could be the government’s candidate for president. Failure to elect a new president will lead to a general election within 30 days, which has frightened the markets. The main opposition comes from the radical left Syriza party, which has been gaining traction in the polls. The party promises a complete turnaround and seeks debt forgiveness from the Troika of lenders that have been supporting the Greek economy via loans in return for economic reforms. “A possible Syriza election victory may force the eurozone to choose between a fiscal union (debt write off for Greece) or the first Euro exit,” Renaissance Capital Chief Economist Charles Robertson wrote in a note. In 2012, over 50 percent of Greeks voted for anti-austerity parties at the risk of losing EU bailout funding, Robertson noted. “Now two more years have passed, Greek GDP has declined, taxes have gone up, unemployment has risen to 25-27 percent and Greek savings have been run down. Even pro-austerity friends in Athens can now imagine Syriza will win an election,” he said. On Monday, Greece received a 2-month extension of its bailout program. The country has received a total of €240 billion since 2012. Greece was the first European country to receive a bailout from the European Central Bank, the European Commission, and the International Monetary Fund. Last week, Prime Minister Samaras rejected raising taxes and cutting government salaries for 2015, explaining Greece, which faces severe debt, deflation, unemployment, and no growth, has hardly emerged from its deep recession. Nationalist parties, such as Golden Dawn, have also appeared on the scene, pledging to work on behalf of struggling Greek people. The party also promises to increase the minimum wage and pensions. In April, investors were more optimistic about the potential of the Greek economy, after Greek bonds returned to the market after a 4-year hiatus. At the time, Deputy Prime Minister Evangelos Venizelos said that "Greece is leaving the bailout and the crisis behind." Protestors have been coming out by the thousands to protest the EU austerity measures which many view as stunting the economy from growth.